Christmas Notebook » kielbasa and cabbage…delicious! We enjoy oven-roasted vegetables, and cabbage is one of our favorites. We often roast slices of cabbage with chopped bacon and olive oil drizzled over the top. 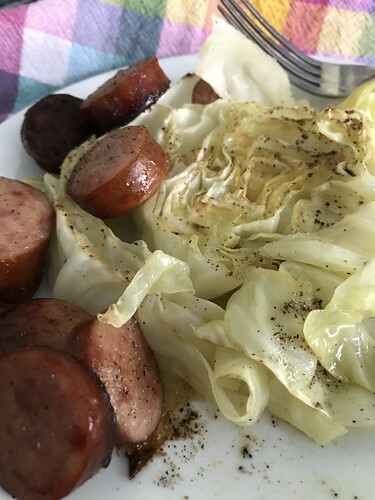 Today I made roasted kielbasa and cabbage. Serves 4-6. Depends on if you serve it on its own or add sides. Slice the kielbasa into half inch slices. Or bigger, if you like. Slice the cabbage into 1″ slices. Lay the cabbage on the cookie sheet. Spread it with a few tablespoons of bacon grease or butter, or drizzle olive oil over it. 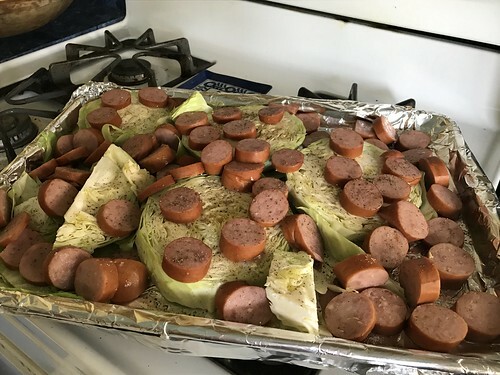 Spread the kielbasa slices over and around the cabbage. Bake on center rack at 400°F for about 45 minutes, stirring or turning the sausage about half way, if you want to. Serve warm with some crusty toasted bread or with a side of fresh garden salad. Corn on the cob would be good, too. It stands alone as a filling meal, though, and doesn’t need the extras unless they appeal to you. This is one of our favorite meals. Delicious for the fall season. Good all winter! I slice the cabbage horizontally, with the stem in the middle. No need to cut out the stem. After roasting, it is tender and tasty. This entry was written by ~~Rhonda, posted on September 26, 2017 at 5:13 pm, filed under Recipes. Bookmark the permalink. Follow any comments here with the RSS feed for this post. Post a comment or leave a trackback: Trackback URL.